This fairy-tale like tower used to be a 14th century medieval city gate on the second walls of Brussels. Others of its kind have all been destroyed, but this one found use as a prison, customs house, grain store, and even a church at one point. Today it is a museum, part of the Royal Museums for Art and History. The museum’s exhibits are about the history of the building, the history of defending Brussels, a collection of arms and armour, and the role of trade guilds in the city. 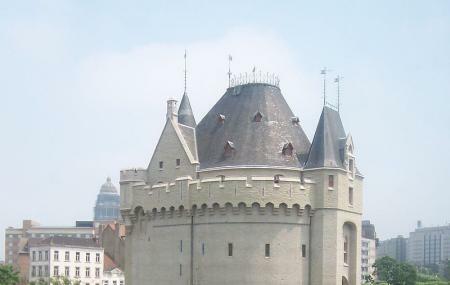 The cherry on the literal top of the cake is access to the battlements at the top of the tower, from where you may take in some great panorama of Brussels. Also check out the mysterious looking cone shaped room on the roof. Each of these highlights are on a different floor. EUR 4 for groups of 15+, senior citizens. EUR 1.5 for 6-25 years old, unemployed and handicapped. Free on first Wednesday of the month after 1pm. Closed at 2pm on 24th and 31st December. Subway 2, 6; Trams 3, 4, 51 stop Hallepoort. Buses 27, 48, 123, 136, 137, 365a, W stop Saint-Gilles Porte de Hal. How popular is Porte De Hal? People normally club together Pierre Marcolini Chocolatier and Law Courts Of Brussels while planning their visit to Porte De Hal. A nice museum focusing on the Renaissance history of the city. It gives a good feel for the structure of the society during that period, including trades and religion. The tower is beautiful, with interesting wood beamed roofs and a decent view of the city. Unfortunately, English information is limited to a free audio guide. Do not waste you time for entry fee (€7). Complete disappointment. The place is a depressing place and most of the rooms are large with little items to look at. The info is only in French and Flemish. No English or other languages are found here. So for me I went around not really learning anything as I don’t speak either language. There are bathrooms in the basement and top floor. I do not recommend coming here as there is hardly a view to see out the tiny windows. One of my favorite museums in Belgium. I recommend.